All those who appear in this photo were murdered in one F16 attack against the building which they sought as refuge. This photo is what remains of them. “Dad, I don’t want to die. 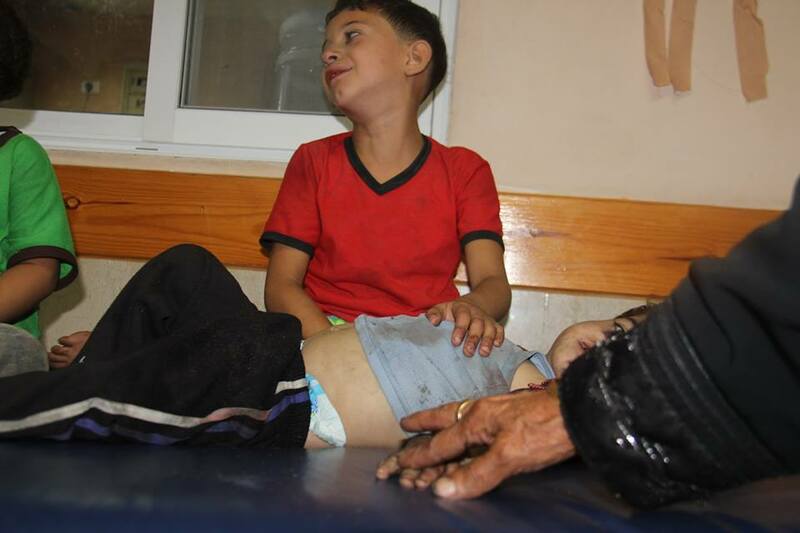 Let us leave here,” six-year old Yasmin Al-Kilany screamed to her father while she was sitting on his lap, terrified. Then her 8-year-old brother, Yasir, also started nagging his father to leave. The children’s ability to cope with the horrors of life in the northern Gazan city of Beit-Lahya had clearly been extinguished, so their father, Ibrahim, decided to move. Beit-Lahya, which is under continuous and random shelling from missiles, F16s and tanks, is almost empty now. A huge number of Palestinian families fled to the UNRWA schools, which have suffered a growing humanitarian crisis as a result. 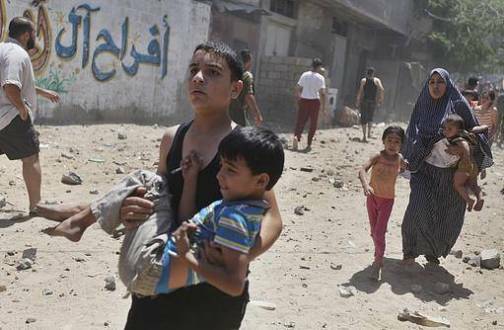 Almost 102,000 people have taken shelter in 69 schools, according to UNRWA. The Al-Kilany family fled to Al-Shijaeyya, but the circle of Israel’s brutal attack continued to expand. 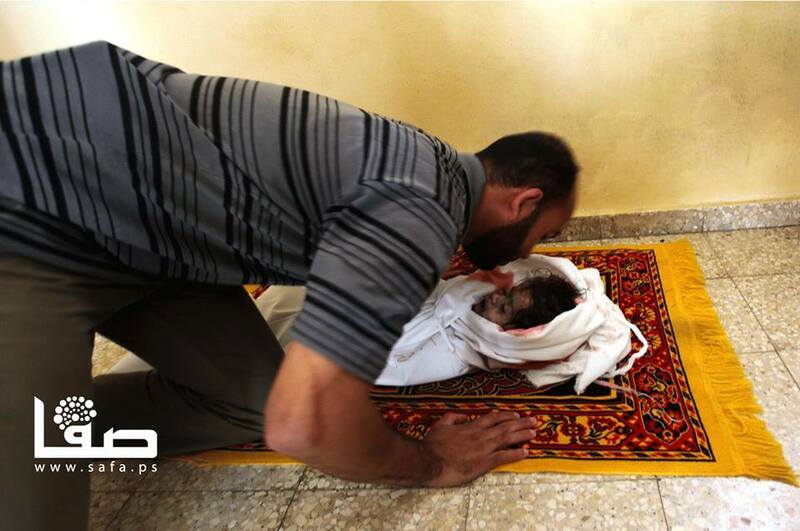 On 20 July, Israel committed an atrocious Sabra-and-Shatilla-like massacre against the innocent people of Al-Shijaeyya, killing at least 66 people, including 26 children. What the Al-Kilany family witnessed in Al-Shijaeyya forced the family to flee, again, along with all the residents who were running barefoot while shells and tank fire chased them. Amidst the bodies that were scattered everywhere between the rubble of the houses, they managed to survive. They rented an apartment in the Al-Israa building in the neighbourhood of Al-Remal, a supposedly safer place. The children calmed down a little. In an attempt to restore a normal family atmosphere after days of horror, the mother, Taghrid, started preparing a dining table for the family to break their fast. Around sunset, while the Al-Kilany clan were sitting around the table, waiting to hear the call for prayer that would allow them to eat, an F16 war-plane suddenly shelled the Al-Israa building, mixing food with their blood and torn pieces under the piles of rubble. 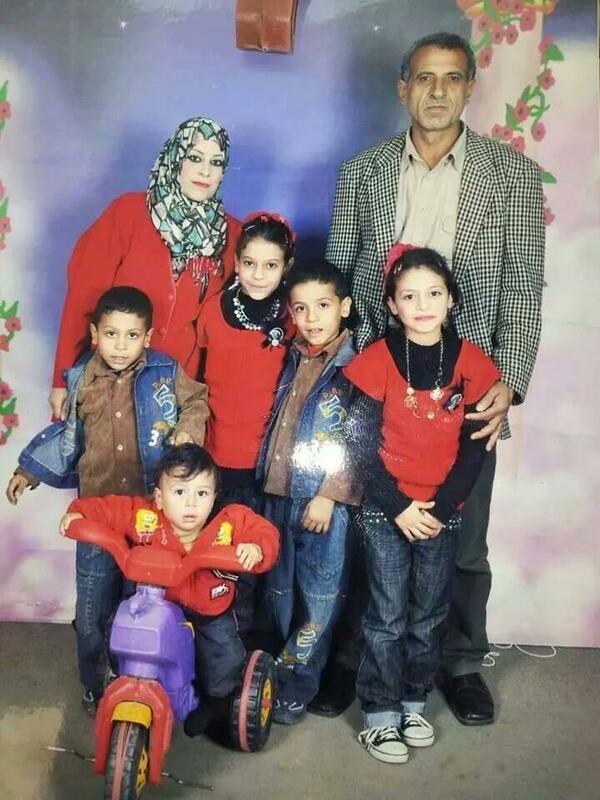 The family simply ceased to exist; Ibrahim and his wife Taghrid, and their five children aged between four and 12, were wiped out in seconds. Like many other families, nothing now remains of them except for rubble and makeshift graves. Among the dozens of massacres that Israel committed against families in Gaza, one or two from each family survived miraculously. No miracle happened though to rescue even one of of Al-Kilany family to share with us the last topic the family discussed before being murdered. No one. The painful story of the Al-Kilany family was painstakingly narrated by Ahmad, brother of Taghrid, to Ola Atallah, a reporter from Gaza. Ahmad was trying hard to suppress his pain while narrating the story. The father, Ibrahim Al-Kilany, held a German passport after living there 20 years. He completed his studies as a civil engineer in a German university and worked as an engineer there for over a decade. He returned to Gaza in 2001 to get married and raise a family. Earlier this year Angela Merkel, the Chancellor of Germany, was awarded Israel’s “presidential medal of distinction.” The German chancellor deserved this honor, some journalists dutifully reported, because of her “unwavering commitment to Israel’s security.” This might explain why Germany has shown no concern over the killing of so many families by Israel, including German citizens. More than 800 people have been brutally killed so far, 90% of them innocent civilians. 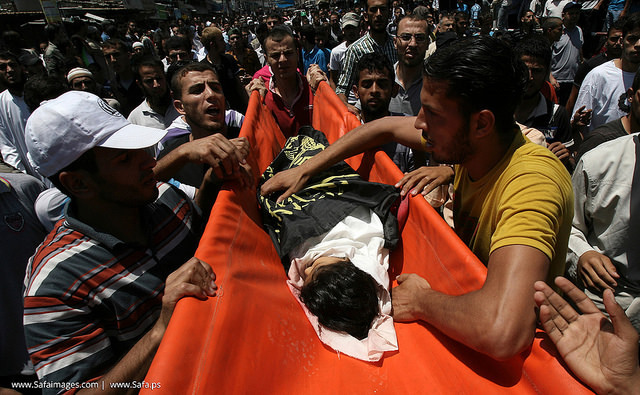 Recognising Israel’s “legitimate right to defend itself” gives Israel a justification to kill them, and kill more. 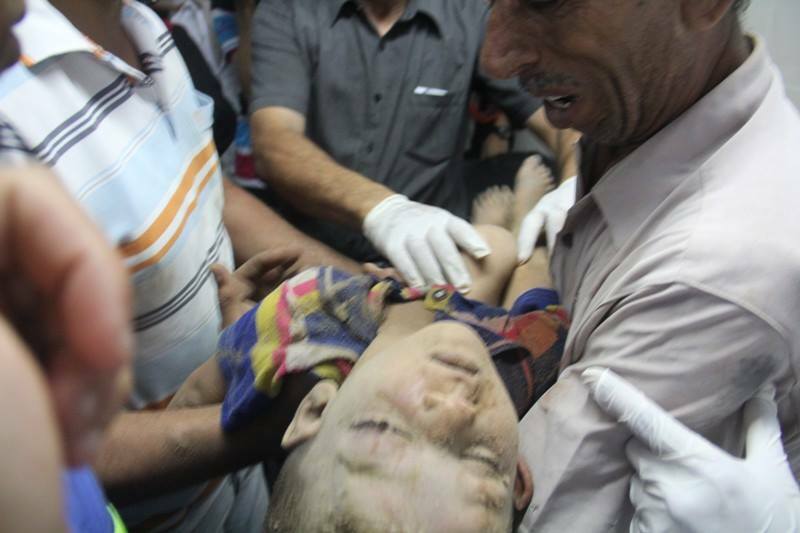 So any “concern” over the human cost caused by Israel in Palestine is meaningless. Our Palestinian people know very well that the EU, and the international Community, is as guilty as Israel as their silence is what gives Israel the impunity and the green light to carry out its massacres. With plumes of black smoke still spiralling into Gaza’s sky, and Israeli shells from land, sea and sky still raining down on the coastal Palestinian enclave, threatening death for the 1.8 million Palestinians living under the blockade of the Gaza Strip, the western governments are still watching and barely doing anything to stop the Palestinian bloodshed, but repeatedly asserting their commitment to Israel’s security. The international media, and international politicians, continue to show a clear bias to the Israeli narrative, which makes them complicit in the ongoing crimes against humanity that Israel is committing against the civilians of Gaza. Our people in Gaza have been left alone to face one of the strongest armies in the world — an army that has hundreds of nuclear warheads, thousands of soldiers armed with Merkava tanks, F-16s, Apache helicopters, naval gunships and phosphorous bombs made in the United States. Gaza has no army, no navy and no air force. And yet Israel plays the victim role. The Israeli attack on our people has continued for 19 days. The Israeli occupation isn’t sufficient by the bloodshed they’ve caused, and continues to blame Hamas for the collective punishment of the population of the Gaza Strip. It is very important that the world acknowledges the fact that we are the occupied and the persecuted. 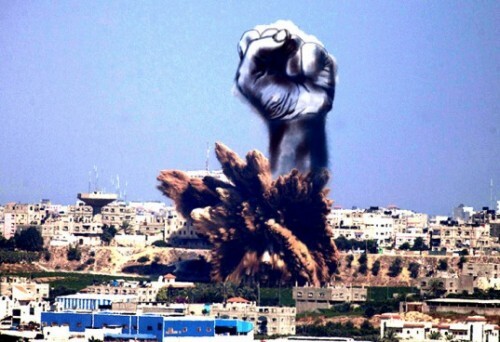 Our resistance should come under the self-defense, not Israel’s terror. We will not forget nor forgive every drop of blood shed by a Palestinian child. We will continue resisting, and neither Israel nor the International community shall manage to break our determination. No one shall stand in the way of our pursuit of freedom, justice and equality. wounded children from Al-Shijaeyya area in Gaza stretching out in Gaza Hospitals which cannot any more accommodate the increasing number of injures. All of them are critical. Where is humanity? Where are the people of conscience around the world? 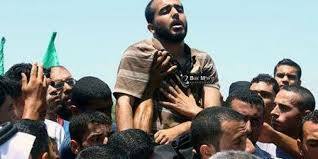 Our people in Gaza are being massacred, under genocide operation. #Israel doesn’t differentiate between ages. After many families were massacred including Al-Batsh, Hamad, Ghannam, Al-Haj. This time many families at once were massacred in Al-Shijaeyya. The families there refused to evacuate their houses, remain dignified in their homes, and reject Israel’s attempt to make them homeless and humiliated with other 60 thousands Palestinians who filled UNRWA schools. Israel’s reaction to people’s steadfastness was randomly shelling their houses with artillery shells, tanks fire and F16 missiles towards the families’ houses who held in between its walls only children, women and elderlies. The Israeli Occupation Forces destroyed houses upon its inhabitants. 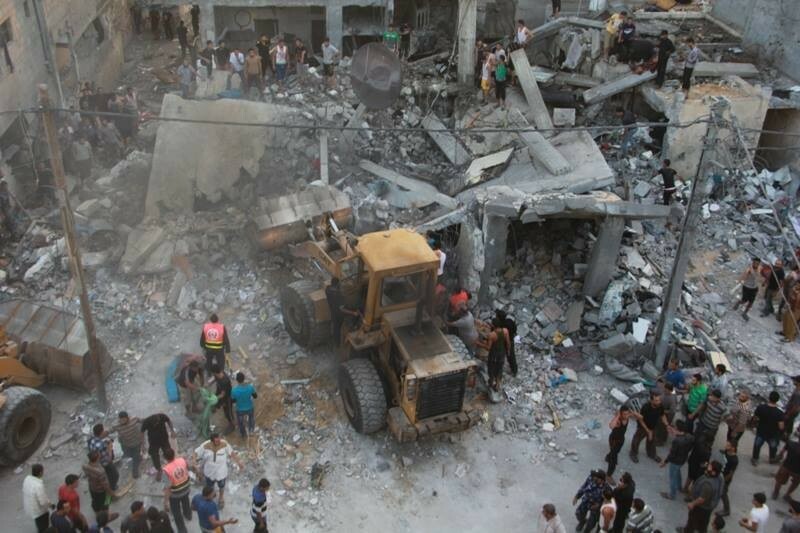 People’s bodies were buried under the rubble for hours. 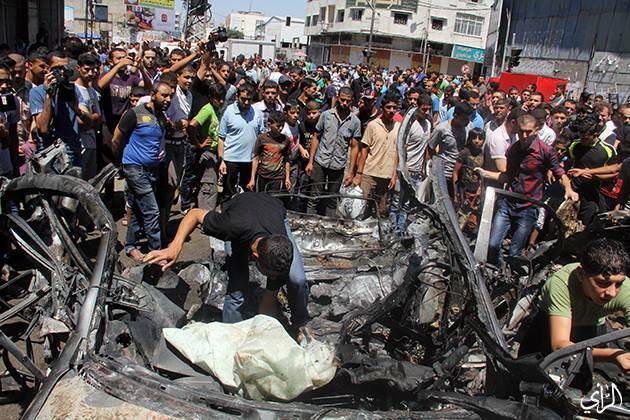 Israel panned ambulances and media to to reach them, rescue them and let the cries of massacred be heard. In an attempt to veil these crimes Israel committed against the innocent inhabitants of Al-Shijaeyya, they prevented media from being there to document the massacre and let the world be a witness of it. When the attack started, the inhabitants of Al-Shijaeyya started running barefoot, traumatised while missiles and artillery shells are chasing them for long distances without finding a safe shelter. But there were no secure refuge. A women with her kids stopped to rest under an olive tree. Her 13-year-old child was sitting on her lap when all of a sudden she found her bleeding, killed after she was targeted by tank fire. Traumatised mother started running again with the rest of her children trying to rescue who survived from them. The Israeli occupation endorsed a two-hour ‘humanitarian’ truce starting from 1:30 pm to 3:30 pm, to let the ambulances take injured and martyrs bodies. Within these two hours, they continued shelling people who were escaping from inevitable murder, committing a terribly atrocious massacre against our people in Al-Shijaeyya, medics and reporters. 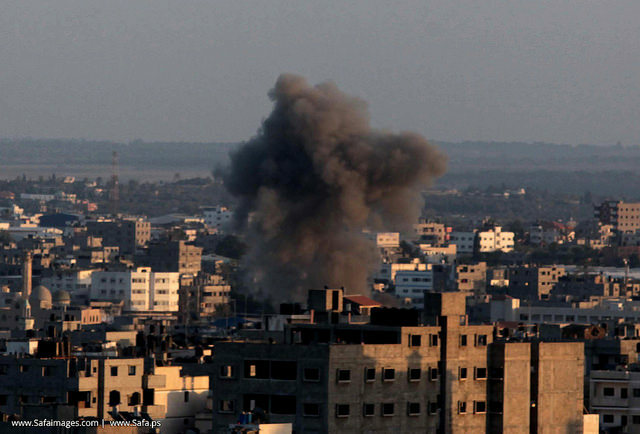 Ambulances hurried to rescue the massacred people there during the two-hour truce, but Israel immediately violated the truce and attacked them. At least two of the medics and reporters were killed. At least nine were wounded. 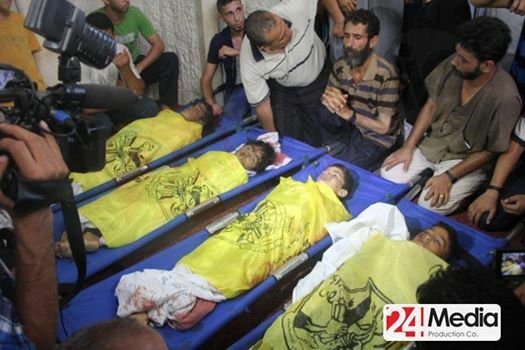 More than 66 people were killed in a cold blood in Al-Shijaeyya massacre, including 26 children. 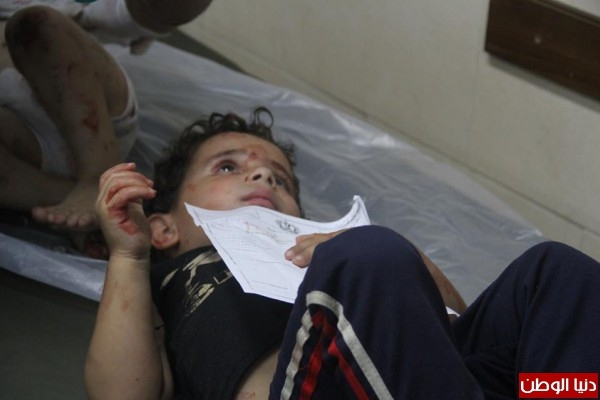 Gaza hospitals received hundreds of injuries, most of them are children and women. There is a shortage in hospitals, in medical equipments. They cannot accommodate the increasing number of the injured people who are all suffering a critical injuries which threatens more lives with death. Palestinians reporters say that they witnessed huge number of wounded people laying on the floor, because there are not enough hospital beds. 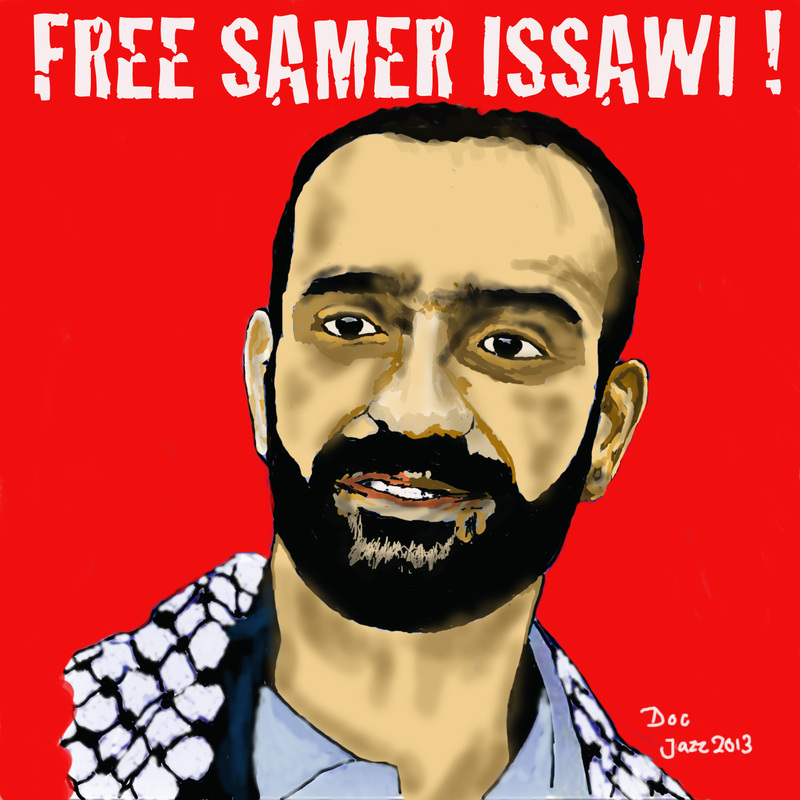 You international activists around the world, especially in Europe and the USA, Israel acts with impunity because of your countries’ silence and unconditional support in all sectors to Israel. Your bias media which inverts between the oppressor and the victim supports Israel to continue massacring our people! Go to streets now and call for an immediate stop to the Palestinian bloodshed! Hold Israel accountable to its uncountable and deadliest crimes against our isolated Palestinian people in besieged Gaza. Call for BDS Boycott, Divestment, and Sanctions. Call for cutting ties with Israel. Let them know that their money and taxes is used to support Israel with weapons and war vehicles to kill us in Palestine. We shall not forgive nor forget. We shall keep resisting with all legitimate means that we have as occupied people until justice is done to every drop of blood Palestinians shed across the 66 years of this ongoing occupation. 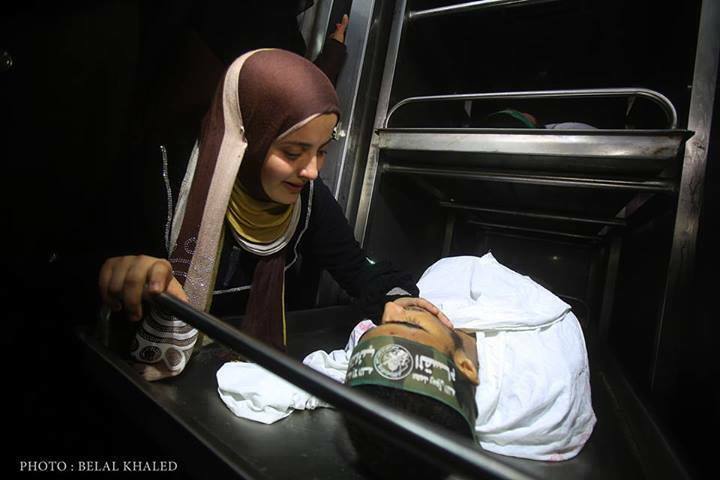 Tareq Fayiq Hajjaj, 22 years old. Ahmad Ziyad Hajjaj, 21 years old. Musaab Nafez Al-Ejla, 30 years old. Resistance until freedom, justice and equality. Glory for the martyrs! Down with #zionism!